Those willing to brave the early morning chill and pre-dawn hours will be treated to quite the astronomical spectacle on Wednesday. A blue moon, supermoon and total lunar eclipse, all packed together as one, will illuminate the Bay Area sky, provided that the weather cooperates. Some have coined the phenomenon "super blue blood moon." There hasn't been a triple lineup like this since 1982 and the next won't occur until 2037. A blue moon is the second full moon in a month. A supermoon is a particularly close full or new moon, appearing somewhat brighter and bigger. A total lunar eclipse — or blood moon for its reddish tinge — has the moon completely bathed in Earth's shadow. The eclipse will be visible best in the western half of the U.S. and Canada before the moon sets early Wednesday morning. 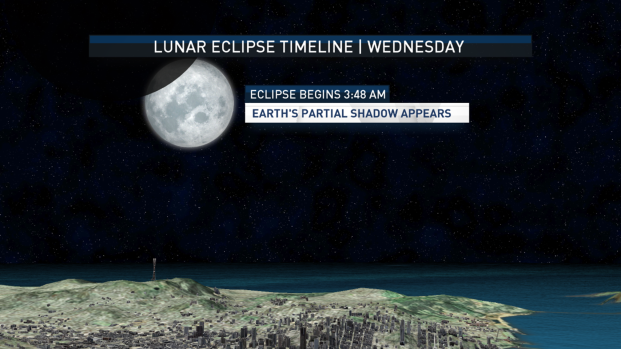 The total lunar eclipse will start to take shape at 3:48 a.m. before the full eclipse kicks in between 4:51 a.m. and 6:07 a.m. The partial eclipse will come to an end at 7:11 a.m. with moonset slated for 7:18 a.m.
Aside from simply stepping out of one's home, finding the nearest rooftop or climbing to the nearest hilltop, people across the Bay Area can visit a few locations opening early to witness the rare display. 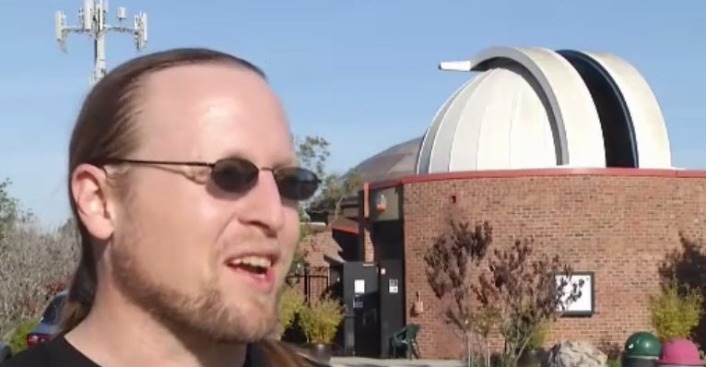 Chabot Space and Science Center in Oakland will open its observatory deck at 3 a.m. for viewing. Those interested in attending are encouraged to bring a pair of binoculars, warm clothes and a blanket or two. Right down the hill, another viewing party is slated to take place at the USS Hornet Sea, Air and Space Museum stationed in Alameda. Visitors 6 years old and above can spend the night aboard the ship and wake up hours later to take in the lunar display. Folks near Los Altos Hills can visit the Foothill College Observatory where a viewing event is scheduled for 4 a.m. to 6 a.m. The Stanford University Astronomical Society will host its viewing from Lake Lagunita by the bonfire pit with hot beverages and snacks from 5 a.m. to 6 a.m.
NASA plans to also provide a live stream of the moon from telescopes in California and Arizona, beginning at 2:30 a.m.